We devote a lot of space to the Via Francigena, an ancient pilgrim walking trail that crosses Tuscany, but we’ve never listed all the reasons why this path is truly worth visiting. Here are 10 reasons why the Francigena is “cool”. 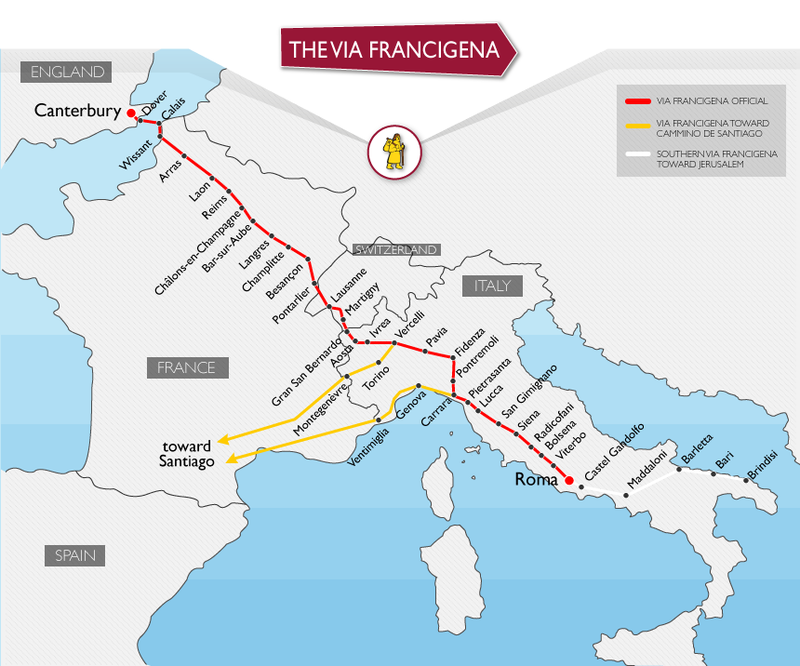 The Via Francigena crosses four countries! The Via Francigena is a long-distance trail following a medieval pilgrim path. The Via Francigena crosses four countries: it starts in Canterbury, in the UK, then crosses France and Switzerland before reaching Italy. This walking trail passes the cliffs of Dover, the Champagne region, the Alps and Tuscany. It offers unforgettable views of some of Europe’s best landscapes. Divided into 16 different stages, four involve the Tuscany region covering 400 kilometers (250 miles)! Let's focus on the Tuscan section of the Via Francigena. For centuries this path has been the trail of pilgrims and merchants, most of them were traveling on foot. Nowadays you can experience the Via Francigena in different ways. Obviously, the entire path is suitable for walkers but we cannot say the same thing if you’re a biker or a horse rider. By bike you can cover almost all the legs, but make sure that you read all the things you need to know about the Via Francigena while planning your trip. If you prefer the pace of a horse-ride, for example, you can explore the Lunigiana, its castles, its medieval villages and enter Fosdinovo Castle as only knights and noblemen used to do, or you can follow the Via Francigena through the Val d'Orcia Area. Beside the St. James pilgrim route, there are plenty of trails for horse riders in Tuscany! Walking through Tuscany, you can find interesting places and incredible scenery that you would otherwise fail to see. Some of the most amazing places aren’t in the guide books or in our blog and are hard to really experience unless you experience them on foot, such as some hidden hamlets that are not on the tourist radar or some secluded farmhouses overlooking beautiful rolling hills and vineyards. Walking through the Via Francigena is a totally immersive experience that helps you to connect with the landscapes and local people. We suggest you read Alex’s experience - he walked from Siena to Rome with his 65-year-old mum. The Tuscan section of the Via Francigena is a 380 km itinerary of history, culture and traditions, immersed in an breathtaking landscape. Along the route there are some well-known landmarks, such as Lucca, Siena, San Gimignano, Monteriggioni Val d'Orcia area (UNESCO site) and Bagno Vignoni—the distant views approaching and leaving San Miniato and San Gimignano are timeless. The rolling hills of Tuscany, with the farmhouses flanked by columns of cypress trees and the walled castles set in a perfect tapestry of vineyards, are seen at their best at three miles an hour, according to Brian Mooney, who covered 2,200km in over 75 days from Coggeshall, Essex, via London to Rome. Beside the well-known towns and villages, there are also some hidden sights to be discovered. Read here some not-to-be-missed hidden gems along the Francigena route. If you don't feel like adventuring in the countryside and facing long treks between one town and another, it’s no problem: enjoy some urban trekking instead! In Siena, every Sunday until November 1, join guided tours to discover the city in the footsteps of the ancient pilgrims! #SienaFrancigena begins from Porta Camollia, where the Via Francigena enters the city and it continues to the Santa Maria della Scala complex, the oldest hospital in Europe, which in the past provided assistance to the pilgrims, and it ends near Porta Romana. The tour lasts for 3 hours and covers 4 kilometers inside the city walls. The ticket, which includes the guide, the entrance fee to Santa Maria della Scala and the packed lunch is 20 euro (10 euro for children under 11 years). Read more about #SienaFrancigena. The Via Francigena crosses many interesting towns that offer cultural events, food festivals and concerts all year round. One of the most important events is the Slow Travel Fest, the official regional festival dedicated to slow travel and outdoor experiences along the Via Francigena. Hosted in the monumental complex of Abbadia a Isola (Monteriggioni) the event offers a rich program of music, street performances, meetings and excursions to better enjoy the centuries-old road. The Via Francigena not only gives you the chance to discover unique landscapes, hamlets and even medieval dishes that are still alive and well today. You can walk like a pilgrim but you can eat like a king! Here is a list of ancient foods that you can still find along the Tuscan route and some ideas for a medieval-style snack. Comparing to the Camino De Santiago, the Via Francigena is much less popular and can be a solitary journey at times. It is also far tougher, which is why you’ll meet highly motivated people or true pilgrims along the way. The Via Francigena winds its way through the mysterious Lunigiana, through some of the most scenic hilltop Tuscan towns and through Tuscany’s enchanting Val d’Orcia. This journey demands a physical and emotional commitment, and it is quite challenging at some points but definitely worth it for the amazing views and the immersive experience. The Via Francigena is not too crowded but it’s not deserted either; you’ll encounter a few pilgrims along the way (and not the torrent of travellers that you’ll find on the road to Compostela) and an authentic road through history, nature and spirituality. Usually the journey is religious, but more often modern pilgrims have no specific reason other than to meditate, reconnect with nature, face inner problems or challenge themselves. You don't need to be a believer to walk the Via Francigena, especially because it’s a very physical challenge and the landscapes encountered are truly amazing. If you’re looking for a spiritual commitment there's no better way to go on pilgrimage along the ancient path and the most important road that leads to Rome, the heart of Christianity. If you enjoy hiking you'll be enthusiastic to face this walking trail, characterized by secret castles, pristine forests, unexpected coastal views, gentle rolling hills, with their changing colors in the seasons, patchwork of wheat, corn and sunflowers fields, scattered farmhouses and dirt roads lined with cypress trees. Whatever your purpose may be, you need to prepare your journey in advance and to read this post that you’ll help you to plan and pack, making the best of your adventure along the Via Francigena. It’s not all about Francigena! The original version of this article was written by Kinzica Sorrenti. Why do so many people start (and enjoy) walking?